Reinforced concrete floors for the industrial sector. Reinforced concrete floors are a heavy duty and reliable solution for waste management companies and ideal for storage facilities, warehouses and busy service or industrial trade yards. We’re pretty delighted with our Civil Engineering team and this finished reinforced concrete slab laid for Biffa Waste Services in Hull. 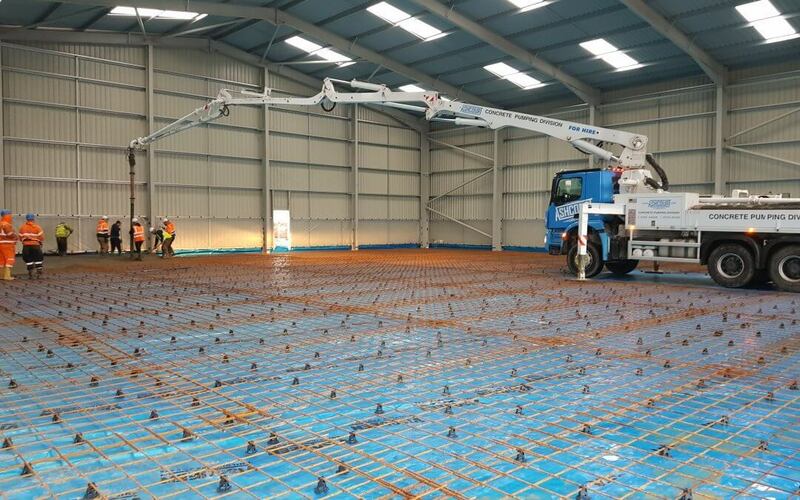 Our Civil engineering team got stuck into the groundworks by digging out the floor, they then prepped and poured the concrete, installed 4m high A-blocks, laser leveled, hand tamped and then glazed the reinforced concrete floor. The finished floor looked great. We offer FREE of charge quotation for reinforced concrete projects combined with a high level of workmanship. Whether your needs are commercial, industrial or residential we offer a variety of reinforced concrete floors for different purposes, from patios areas, driveways, delivery yards and roadways. We can also offer a variety of finishes on our concrete floors from Hand troweled, power gloated, tamped, dappled, coloured, bush hammered and luxury domestic finishes. Our skill set doesn’t just lie there, we offer complete project services including drainage repairs, new sewer connections and all type of drainage groundworks, Wilkinson Environmental’s Civil Engineering department also specialise in all road surfacing works and have completed a number of rapid set concrete and reinforced concrete jobs for waste management and utility yards. We can also specialise in car parks, new roads, walkways, pathways, kerb laying, playgrounds, driveways and landscaping. At Wilkinson Environmental we are also specialists in all drainage groundworks and can offer a complete range of drainage services including pipeline pressure testing, ground water control, flood mitigation as well as vessel cleaning including forecourt oil interceptors and private septic tanks. Based in Warwickshire, The Midlands Wilinson Environmental work all over the country including Birmingham, Leicester, Coventry, Derby, Nottingham, Reading, London, Bristol, Worcester and Gloucester. Visit our page for more information on reinforced concrete floors.